On September 13, 1959 twenty-five members of the Presbyterian faith met for divine worship in the Assembly Hall of Meadowbrook High School and set the stage for a dynamic local mission – the Meadowbrook Presbyterian Church. Led by the Rev. W. R. F. McGhie, Minister of Webster Memorial Church, these faithful Christians attended regular worship services but were not content to make the school building their church home. Their expressed desire was realised when in 1961 a site was acquired for the erection of a church building, and, in the same year an architect drew the plan. 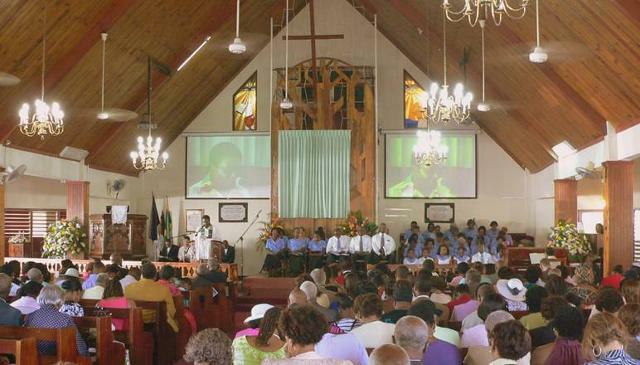 Based on the decision that Meadowbrook Church should be congregated with a full-time Minister, the South Eastern Presbytery of the Presbyterian Church of Jamaica met in the Meadowbrook School Hall on Sunday, January 8 and declared the congregation an official congregation of the church. Sunday, January 15, 1961 saw the serving of communion for the first time with twenty-seven persons signifying their intention of becoming regular members, and Mr. P. R. Miller as the first Elder. The numbers were small, but what was lacking in numbers was made up for in grit, sincerity and determination. Under the able leadership of Rev. Neil Banks, the first resident Minister, the building of the church was started. The building was completed in 1965. The formal dedication of the church took place on March 6, 1966, and uniquely, Meadowbrook became the first new church building to be opened after union of the Presbyterian and Congregational Churches. Ever since its establishment, the Meadowbrook Church has been blessed with inspired, loyal and dedicated ministers. With the pioneering work of the Rev. McGhie, Deaconess Madge Saunders (later Rev. Saunders), Rev. Ray Scheneder and Rev. David Stevens well on its way, the Rev. Oliver Daley and Rev. Coke brought new dimensions to the work of the church. Rev. 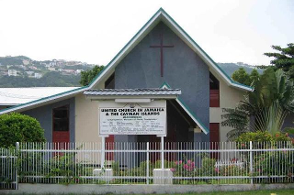 Raymond Coke was called to become Minister of this church in 1978. It was during the period of Rev. Oliver Daley that the church Hall and Manse at Whitney Drive was built. In 1984 under the leadership of Rev. R. Coke, the church was extended. From inception the church has taken a keen interest in social outreach programmes establishing two Basic Schools, a Community College, a catering Project, and a home-work centre. The church continues to make progress under the leadership of the following persons: Rev. Dave Spence who succeeded Rev. Dr. Collin Cowan; Rev. Dr. Derik Davidson, interim Pastor; and presently Rev. Norman Francis. As we reflect on the early beginning of the church, we can truly say that from "little acorns mighty oaks do grow". Today, the church boasts a membership of over seven hundred and has an array of services provided for the church and the community. With the expansion of the original building, Meadowbrook United Church does not only provide a most pleasing atmosphere for worship but is well posed for a fruitful christian ministry in the community. We pay tribute to the early founders and thank the Almighty for their christian foresight and vision. As we continue the work and gird ourselves for greater service and outreach may the glory be always ascribed to God. And so, as we seek to witness for Him may we, through our lives and conduct, present Jesus Christ so that by the power of the Holy Spirit men shall come to put their trust in God and to accept Him as their Saviour, serve Him in the fellowship of the Church and follow Him in the vocations of the common life. May God bless you as together we work for the expansion of His kingdom on earth.